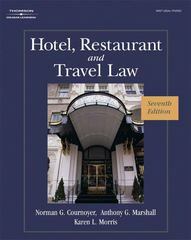 Hotel, Restaurant, and Travel Law 7 Edition For students and practicing professionals in hospitality, travel and tourism as well as specialized paralegal work, Hotel, Restaurant and Travel Law: A Preventative Approach, 7th Edition, addresses legal issues confronted by managers in the hotel, restaurant, travel and casino industries. The emphasis is on prevention of legal violations. By reading the book, managers can appreciate and identify what actions and precautions are necessary to avoid, or at least minimize, the number of lawsuits. The book uses the case method, long recognized as a helpful approach to learning the often-complicated discipline of law. Readers will study decisions from actual cases in which hospitality establishments were sued, as well as what legal precedents were cited.